In April 2018, one of the largest newspapers in Greece in terms of circulation, to Vima, dedicated a whole page on Academous. If it is not all Greek to you, we spoke about Academous and our experiences so far, Research and Higher Education and you can find the full article here. We would like to thank the reporter Olga Klontza and everyone who helped us make this publication happen. More good news! In February 2018, Academous was voted as 1 of the top 100 most innovative businesses in Greater Manchester according to the Business Quartely magazine. You can find the full report here (we are on page 12-13). Academic Rankings of World Universities (ARWU) is a list of top Universities published every year since 2003 by ShanghaiRankings Consultancy. It is also one of the oldest if not the oldest Ranking tables for World’s top Universities. – Quality of Higher Education Institutions has improved over the years. Since 2003 the number of countries with at least 1 University appearing on the tables has increase gradually (from 39 in 2003 to 45 up to 2016 and to 56 in the 2017 tables). – Some countries have seen the number of their Universities remaining more or less the same. For example there were 42 German Universities in the 2003 tables and 38 Universities in 2016 tables. UK Universities show a similar trend. – Other countries have seen the number of their Universities declining. There were 38 Japanese Universities in the 2003 tables. In 2016 only 16 Universities from Japan were in the top 500 Universities. – A few countries have seen the number of their Universities increasing. In 2003 Australia had 13 Universities in the top 500. In 2016 23 Australian Universities made it to the top 500 world Universities. Higher Education in China has seen major improvement since 2003. In 2003 ARWU tables only 8 Universities were included in the world’s top 500 Universities. In 2016 41 Chinese Universities made it to the top 500. In 2017 ARWU tables China is in 2nd place in terms of number of Universities, followed by UK and Germany. – Since 2003 the percentage of Universities from the OECD member countries in the ARWU tables has been declining (from 93% in 2003 to 77% in 2017). BRICS – Brazil, Russia, India, China and South Africa- have seen a gradual increase in the number of Universities ( from 4% in 2003 to 15% in 2017). Also more Universities from countries that are not in the OECD or BRICS made it to tables (from 2.6 % in 2003 to 7% in 2017). More Universities from countries such as Saudi Arabia, Malaysia and Thailand can be seen in the World’s top Universities of the last few years. – The increase in the quality of Higher Education in Asia is also obvious from our final pie chart of our infographic. There are more Asian Universities in the latest ARWU rakings than Universities from North America. European Universities are still in the 1st place. Times Higher Education published recently its latest tables with the best Universities in the World. We love data. 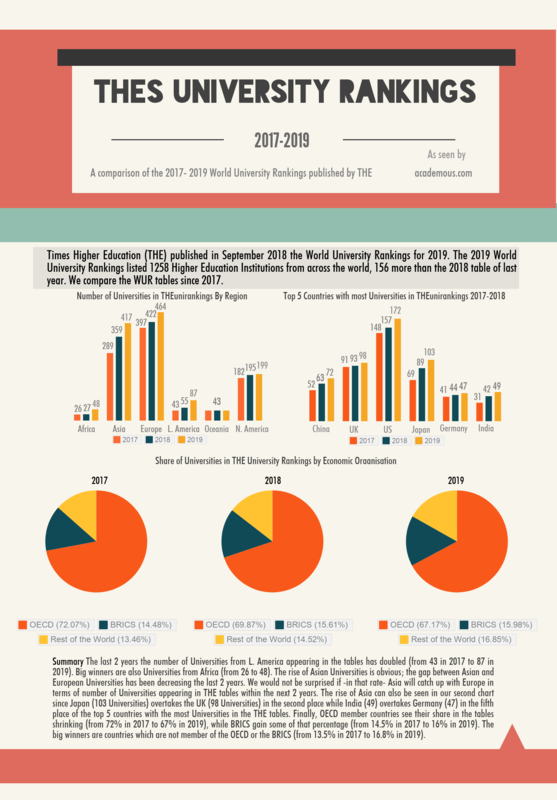 So we crunched the data from the last 7 World University Rankings and we present some of our findings in this beautiful infographic. Enjoy!